A defect in the eyes of man can be a blessing in the eyes of God. Many men and women have become closer to their Creator through their suffering, and in the words of one such man, Whick D. Turner is not ‘Defective’ but ‘Effective’ for the Kingdom of God! Whick has just one single purpose in life, and that is to serve his Creator with all of his heart, his soul and his strength. Born in 1965, Whick was as normal as the next child, but it gradually became evident that he was having difficulty in learning to speak. He was fitted for two hearing aids and then underwent years of speech therapy to enable him to speak properly. However, that was just the beginning of Whick’s problems, because at the age of 8 he was diagnosed with nerve deafness, an incurable form of deafness due to an inactivity of the nerves that pass the messages to the brain. When he reached 18 he was suffering defects in his sight, and was diagnosed with Retinitis Pigmentosa (RP), a genetic eye disease that leads to incurable blindness. This combination of RP and progressive deafness became known as Usher Syndrome Type II. To suffer this as a young man of 18 years of age was a challenge that Whick met head on with his faith in God. Facing both blindness and deafness as he grew older, he reacted in a way that not many people could. his physicians when rather doing as most would do at his age, fold and weep, Whick discovered a natural talent for playing the drums. Rather than withdrawing into himself and adopting a feeling of self-pity, this young man sought new challenges and mastered them. He not only found new interests, but developed a passion for worship that was displayed in his lifestyle, and he gave God all that he had. He not only took the view that with God all is possible, but also proved it with his own life. He set an example of faith and courage that is an example to everybody facing insurmountable odds. 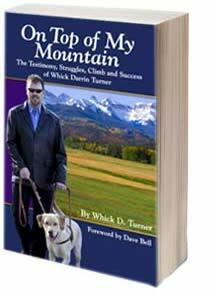 In Whick’s book “On Top of My Mountain”, he shares his struggles, his climb and his success in reaching the top of his personal mountain, and offers hope that others can achieve the same in spite of their limitations and disabilities. It is an uplifting testimony to the power of human faith and endeavor, and how faith in God can help men and women to overcome the most severe of difficulties. It is always uplifting to hear Whick say “I am able and not disabled” and his story is encouraging to everybody that reads it, no matter the struggles they personally face in their own lives. His goal is that all who read his book would find inspiration to succeed in life, and use the gifts and talents given to them to be a greater blessing to others. There is certainly no mountain high enough for Whick not to climb, and his visual and hearing impairments are certainly not limits to his abilities. Whick’s one desire is to inspire everybody with whom he comes into contact to reach the dizzy heights he has reached by holding their hands out to Jesus Christ and reaching their personal summits for the glory of God. “Life has had its challenges for Whick, yet despite his visual and hearing impairments, his faith in God has kept him strong and encouraged. I have seen first-hand the life that Whick has lived, and it is one of courage and determination. For additional information or to book Whick D. Turner as your next guest speaker, please visit www.ontopofmymountain.com or email Whick directly at whick@att.net.